France’s top Muslim official has suggested turning empty or abandoned Catholic churches into mosques, saying as many as 5,000 are needed for the country’s Muslim population - the largest in Europe. “It’s a delicate issue, but why not?” Dalil Boubakeur, rector of the Grand Mosque in Paris and the president of the French Council of Muslim Faith, told Europe 1 radio on Monday. There are currently about 2,500 mosques in France with another 300 under construction, but the number falls short of what is needed, he said. With roughly 5 million Muslims in France, at least 5,000 mosques are needed, Boubakeur said. During the interview with French radio he gave an example of the transition of a church into a mosque in Clermont-Ferrand, which was welcomed by the local religious community. The church had been abandoned for more than 30 years and the building was given to the Muslim community in 2012. "It's the same God, these are neighboring rites, fraternal, and I think that Muslims and Christians can coexist and live together,” he said. It’s not the first time the lack of places of worship for millions of Muslims has been brought up in France. 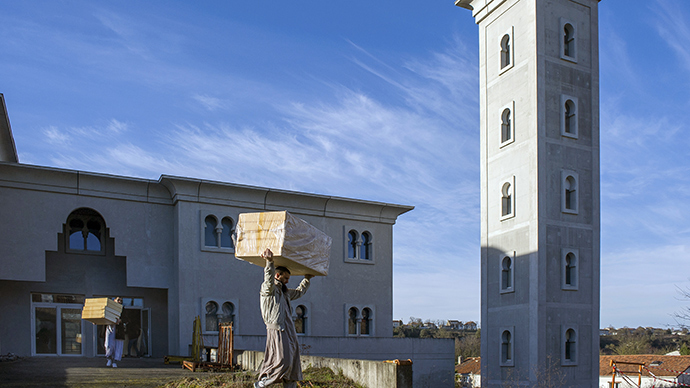 In April, Boubakeur called for doubling the number of mosques. His remarks were welcomed by the Christian community as a “legitimate” demand. “Muslims should, like Christians and Jews, be able to practice their religion,” Monseigneur Ribadeau-Dumas, spokesperson for the Bishops’ Conference of France, told French radio station Europe 1. The party’s leader Marine Le Pen called to stop the construction of new mosques in March. “We must today freeze the construction of new mosques while we verify the origin of their financing,” she said in an interview to France 24. The question of building closer ties with the Muslim community was discussed at the talks between the French government and about 150 Muslim leaders in Paris on Monday. French Prime Minister Manuel Valls stressed there was no link between extremism and Islam. "Islam still provokes misunderstandings, prejudices, and is rejected by some citizens," he added. "Yet Islam is here to stay in France. It's the second largest religious group in our country." The first conference between the government and Muslim community leaders comes five months after the Charlie Hebdo and kosher store jihadist attacks in Paris that killed 17 people. The terrorists responsible for the attacks "belong to a different world than we do," said Boubakeur, speaking at the conference. There has been a huge increase in anti-Muslim incidents in France following the Islamist attacks in Paris. A report issued in January by the National Observatory Against Islamophobia said that over the month there has been an 110-percent increase in attacks.